To bear witness, as Jordan insists on doing, is no small task when the world-making and destroying machinations of such formidable global power plays are simultaneously obscured by the shadows such catastrophes cast over their victims. Bearing witness with the intention to forge the language through which catastrophe is made seeable and knowable is particularly and forcefully discouraged. June Jordan’s determination to bear witness is a testament to her commitment to an elective affinity emergent of “inveterate statelessness,” to borrow liberally from Fred Moten. Who June Jordan is as a witness – a Black woman, queer, feminist, Caribbean, American, essayist, journalist, poet, tirelessly courageous – is thus an essential aspect of her being and practice to recognize and hold aloft. That I begin with a reflection on June Jordan, a Black woman, is not incidental. That I am a Palestinian, no poet but a theorist informed by the intellectual orientation and promise of the field of Black studies and the study of Black literature, is also not incidental. I am a student of Black liberation, I must foreground and cite the Black women who guide us in the commitment to action that the work of solidarity entails. The deliberate targeting of Ilhan Omar – and the curious silences that suffuse the discourses circling this event – demands that I too bear witness. You know where this story resumes. 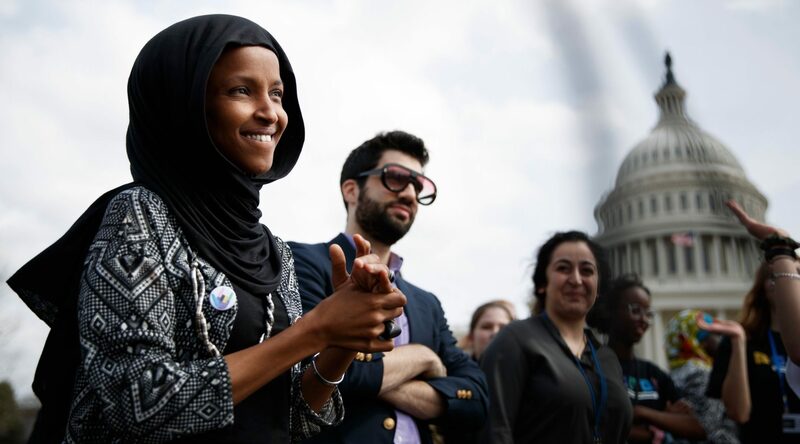 The Congressional Democrats took it upon themselves, in yet another appeasement to the pettish whims of an unapologetically grotesque and, in so many cases, overtly anti-Semitic GOP, to censure Representative Ilhan Omar for expressing her concern about the troubling nature of the U.S. relationship with the state of Israel and the seeming impossibility for individuals like herself to speak openly about it without being derailed. The amenability of the Democrats in conducting the Republicans’ dirty work alongside them proves Omar quite right, even if these efforts were forestalled and eventually (sort of) abandoned. Even aside from the broader resolution's espousal of the heavily criticised working definition of anti-Semitism formed and circulated by the International Holocaust Remembrance Alliance, this list, documenting the “insidious, bigoted history” of “dual loyalty” rhetoric is a clear allusion to the mischaracterization of Omar’s comments about AIPAC's influence on American foreign policy relations with Israel. The silences in this enumeration of bigotries are deafening. At whose behest did Executive Order 9066, which established the internment of Japanese Americans, occur? What nameless entity convicted Alfred Dreyfus? What “conditions” did Muslim-Americans in the United States face, and from where did these conditions emerge? The institutional parties and practices responsible for these logics of perpetual-othering, that which targets, ostensibly, Muslims, Japanese Americans, Jews, Catholics (and are there others?) is nowhere to be found. The state is tucked away in the passive voice. The agents of anti-Semitism and Islamophobia are instead spectres, individuated and capricious, people we can see and imagine are harbouring anti-Semitic ideologies. Might it be the Black woman in a hijab? this grammar seems to suggest. I do not care to plow through the muck of debates over what Omar did or did not say, for other and better observers have demonstrated how dishonestly represented Omar’s clearheaded critique of outsized U.S. (white, evangelical, bipartisan) preoccupation with the Israeli state and support for its occupation of Palestine has been. I have no right to define the delicate contours of modern anti-Semitism, although the reanimated public presence of white supremacist rhetoric and hate groups impacts us all and our shared commitment must be to combat these organizations and rhetoric for and with one another. My primary concern is that we do not lose sight of the fact that Omar’s presumption to expose and critique the extent of the U.S. imperial apparatus while being Black and Muslim and a refugee also makes possible these ongoing and thoroughly bipartisan attacks targeting her. The United States, in particular, though not uniquely, is predicated on white supremacy, settler colonialism, and racial capitalism. These conditions envelop us even as the state is designed to exceed our sight, uncontainable in its immensity. Following Giorgio Agamben and Achille Mbembe, we can see then that this state was constructed in exception. To presume that we are unable to see the state that interned Japanese Americans and facilitated the mass tracking and surveillance of Muslim (and Muslim-adjacent) communities in the U.S. after 9/11, yet take that very same state to beneficently dictate the precise coordinates of anti-Semitism while it functions as a tool for white supremacy, is to curtail witness. We cannot reasonably be able to hold the state to account or capture the might of its power (and the powerful people at its helm) in our sight while the state itself is doing the accounting. Yet, Ilhan Omar presumes to hold the state to account. Both her and her colleagues, congresswomen Rashida Tlaib, Alexandria Ocasio-Cortez, and Ayanna Pressley have all, variously, sought to hold the state to account since assuming office earlier this year. But the logic of the state itself, rooted in white supremacy and settler colonialism, unctuously beholden (yes) to its alliance with another – in fact, several other – states wherein exception is the rule, refuses to be held accountable. On this, Democrats and Republicans agree. And against this, Ilhan Omar is a Black Muslimah, a Somali refugee, and an American, whose difference has been insufficiently managed by the state and so must be isolated and aberrant to make sense (and therefore, to be portrayed as insensible). That such singularly vicious attacks against anti-Zionist public figures and critics of U.S. foreign policy are directed towards Black women, Jews of colour, and Black and non-Black people of colour more broadly is precisely the design of it all. We are meant to be isolated, our ways of being and seeing together displaced, all our perspective and labour rendered insignificant, insubordinate, unrecognizable. We are meant to be isolated from one another. There are over one million Somalian refugees on this earth, and millions of Palestinian refugees alongside them. Refugees are always within the brutal sight of the state, and yet are also exceptions: refugees are stateless, but survive. What promise might we realize when we insist on recognizing one another beyond the state? What accident is it that Ilhan Omar, a Somali refugee herself, is courageous enough to commit to freedom (flawed though I believe her vision for Palestine may be) alongside other stateless peoples? Certainly, we must acknowledge that Omar is responsible for pushing nearly the entire docket of Democratic presidential candidates against attending this year’s AIPAC conference. It is the promise of our relationality – our ability to recognize one another across the planes of disparate and coeval oppressions and emancipatory struggles – that constitutes a threat to power, and to the state. Isolating Ilhan Omar as a problem, whether a problem for the Democratic party or a problem for the logics of the state entirely – a problem by virtue of her own relation to the world and those who experience the world as she does – is an attempt to delegitimize the discourses of liberation that spring from our mutualities and our relations. A Black woman from Somalia, a Muslimah, refugee, African, American, citizen: all of this and more. Omar’s own multitudes, like June Jordan’s, reminds us that our mutual recognition is always a threat that must be contained. But here, there is also hope. The movement to defend Ilhan Omar that emerged from this fight is an additional layer atop the many, elective affinities that we, those deemed aberrant or non-existent or who are forgotten to exist, cultivate, together. As more and more of us recognize in one another the potential for a unified front against hate and towards true emancipation from the predatory systems of power that threaten to destroy us all, we become, together, entirely new. We possess the power to imagine ourselves, together. I have always shied away from relying on this poem to evoke the communal recognition and work that our solidarities in these times demand. I thought it too pat, too devastating and romantic and hopeful, a commitment that I am unsure we, Palestinians in the diaspora, have done enough to fulfill from our end. Perhaps I have been wrong, or too skeptical. What Jordan encapsulates in this passage is not the seamlessness through which her experience as a Black woman leads her to identify with Palestinians displaced and killed before, during, and after the 1982 massacre. Rather, Jordan traces her route toward a particular moment of recognition for the possibility that her perspective entails. She was born a Black woman, and is ever in the process of becoming just so. Palestine is one stop of many on the pathway to freedom, to home. We bear witness, and responsibility, for one another along this path. We are accountable to each other, we hold one another to account, we wrest our accounting back for ourselves. This is the work, and the promise, that our relationality commands and the state can never endure. Sophia Azeb teaches at the University of Chicago.